Healthier Eating in the New Year is Possible! Ever feel you would like to go out to eat, but not really feeling in the mood for the caloric- and cholesterol-laden assault on your stomach? Most restaurants get their glory from offering diners rich comfort foods and upscale delights rendered with love, but also a heavy handful of richness from butters, creams and all things fried. The easy answer, so what, I don't eat out that often or I don't finish the meal or, wait, this is the best one … I deserve it … had a rough day and I did work out last week. For most of us, a fat suit is waiting, ever patiently, for its day of fulfillment. The obesity trend is out there and the statistics are scary. According to the New Hampshire Department of Health and Human Service Division of Public Health Services, 60 percent of all adults are overweight or obese. Is this caused by our "Fast Food Nation," lack of activity or lack of knowledge? I would venture a "bite" of all the above. A proposed new law would require calorie labeling on menus and menu boards in chain restaurants, retail food establishment and vending machines with 20 or more locations. It's your call whether this is communism or consumer rights, but I would think people would want to know what exactly they are putting in their mouths. Many chains already offer this information and it does give you pause before you recite your order. It also makes the chains strive a bit harder to make tasty food with lower numbers. But what about local restaurants? I am sure they have heard the call for lower calories too. Many restaurants do not fall under the new federal menu-labeling legislation nor does the state require them to offer healthier options, yet an initiative has begun. Luca's Restaurant in Keene was one of the first to participate in Turn a New Leaf, the first county-wide healthy dining initiative starting in New Hampshire. Cheshire County HEAL (Healthy Eating, Active Living) developed the program in late 2011 with four participating restaurants. Now five more have joined and Nashua HEAL is in the early stages of implementation along with Upper Valley HEAL, which partnered with Dartmouth-Hitchcock Medical Center in their program called Easy Choices in the Lebanon area. Hospitals are a natural fit, but the program is spreading. In August, The Common Man in Ashland began offering a separate healthy menu complete with children's options that are not fried. Several other Ashland restaurants are participating too. It's all just a start for now. HEAL is active is pairing restaurant owners and chefs who are interested with local dietitians for ideas on lowering caloric content and figuring out exactly what the count is. Director of HEAL Terry Johnson says, "We want it to be easier to eat healthy and have it done in a way that fits in our routine. More people are demanding the nutrition information and it can't be done without labeling. It can be as simple as a heart or leaf image on the menu signifying lower calories and or less fat." Johnson says even salads can be sneaky. Although they are a traditional dieter's choice, candied nuts, candied fruits and rich dressings can make them tip the scale. He wants to empower the consumer. If you know the caloric numbers, you might decide to just use portion control and have half the meal put in a to-go box before you start eating. If you think the government should stay out of lifestyle choices, Johnson says, "Even registered dietitians don't always pick the healthiest choice because of hidden calories. It is just difficult to choose without labeling. It's a real challenge." For the past three years, T-Bones has offered "In the Pink" choices on their menus. An image of Executive Chef Nicole's pink chef jacket signifies items scattered throughout the menu that are 650 calories or less, 10 grams of fat or less, or 10 grams of net carbs or less. In addition, the kids' menu at T-Bones and Cactus Jack's is peppered with LiveWell items in partnership with the National Restaurant Association guidelines. Owner Tom Boucher says, " These programs are gaining in popularity." He admits it's taken a while for people to really start ordering the healthier food even though they knew they should in the beginning. Boucher says, "It's important to start them young." Boucher was impressed with Michelle Obama's Kids LiveWell Campaign and implemented it at Cactus Jack's. Chef Nicole, with her own two young children, has started them on Brussels sprouts at 2 years of age just to train their palates. NH Farm to School is working to connect New Hampshire farms to local schools. These connections can enable cafeterias to serve healthy and locally grown foods. Other healthy food initiatives abound across the state. Local food co-ops, including the newly-minted-but-not-yet-open Manchester Food Co-op, are sources for spreading the word on healthy choices, and most have their own chefs producing nutritious meals for take-out or dine-in. Food pantries are targeting donations of fresh vegetables to offer better choices for families in need. Joining a CSA (Community Supported Agriculture) is a great way to make better choices at home. You need to get pretty clever with kale in short order. The times they are a-changing. Knowledge is key and any way that the wind can be encouraged to change direction is a good thing. Here's to your health! Click here for a beetroot and poached pear soup recipe from Natalia Strong, owner of the Soup Gallery. The Soup Gallery tucked behind 55 Main St. in Concord (enter through Capital Plaza). Owner Natalia Strong is committed to offering healthy, organic and flavorful soups as a lunchtime offering. She started the business after making soup for her yoga students and the demand just grew stronger. Monday through Saturday the cozy restaurant, complete with bar, offers four to five artisanal soups complete with a soup tasting if you can't make up your mind. In summer the patio seating is lovely. What a Crock! is a similar operation for lunch at the International Marketplace at Pease in Portsmouth, open only for lunch until 3 p.m. Owners John and Dawn Knorr offer eight daily soups to stews that range from sausage and butternut squash to Texas Turkey stew to "Floribbean" Catfish Chowder and Ethiopian Red Lentil. John's elegant cream of mushroom soup is one of his favorites that he makes at home. Look for it at the restaurant in January using local mushrooms from the New Hampshire Mushroom Company and cream from Hatchland Dairy. Knorr says, "We want to make sure people can get a nutritious and healthy meal." The Soup Guy in Dover sells his homemade soups via winter farmers markets, the Durham Marketplace and online. Owner Curtis Gould uses fresh local vegetables and homemade organic vegetable broth. Collins Brothers Chowder Company at 59 Temple St. in Nashua has them standing in line at open for their hearty soups. Not touted to be organic or natural, just freshly made, the chowders may be the best choice. Cash only and open just Wednesday through Saturday starting at 10 a.m.
Marilyn Stolper has reopened her Loaf and Ladle in Exeter at 100 Domain Dr. off Rte. 111. Well known for her soups and cookbook, Stolper was able to reopen after closing her troubled downtown location. Exeter has always seemed to be a soup mecca. Blue Moon Evolution at 8 Clifford St. is well known for their healthy fare including savory soups. Seacoast Soups at 122 Lafayette Rd. in North Hampton is a one-woman operation run by Dina Williams. Her spicy Thai soup is a customer favorite. She offers two other options daily plus the Thai soup because she just couldn't take it off the menu. The Soupery is a new outlet opening in January by the owners of the Juicery in Portsmouth at 51 Hanover Street offering fresh wholesome soup made in small batches. 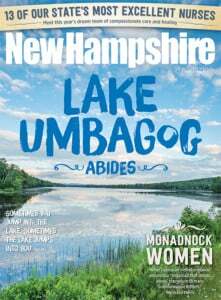 Consider their Sebago jalapeno beer and cheddar or Maine shrimp corn chowder to grab and go. The soup is on … drink to your health.